Inspired by Chris's work and the opportunity that it provides individuals to interact with it; many people have found creative uses for the Prayer Wheels in their lives. Prayer Wheels have been used in weddings, anniversaries, to honor individuals, to celebrate the beginning or ending of something special, to celebrate the spectacular world that we live in, and to celebrate places of worship. People can write their prayers, vows, hopes, dreams, and blessings on paper and place them in the vessel for posterity. Many of these wheels are custom designed to reflect the interests of the people getting it. 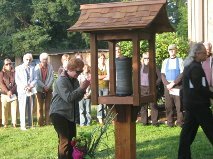 I have always felt honored to create an Urn or Celebration of Life Prayer Wheel. What a beautiful and meaningful way to honor our dear family and friends. Some Celebration of Life Wheels serve as safe-keepers of special memories – a meaningful letter, photographs, a poem... a feather... a wedding ring.... Other Celebration of Life Wheels are designed to hold a beloved's ashes. People often opt to provide their own inner vessel to hold ashes. I can also make a lidded ceramic vessel to fit snuggly inside the prayer wheel. Depending on the wheel's size, both ashes and special mementos may fit inside. Axis of Hope Preyer Wheels have been used in many settings with the intention of healing the Earth, its habitats, humanity, and individuals. The first Prayer Wheel made was in response to the Whatcom Creek Pipeline explosion and the one that was created for the ten year anniversary of the tragedy celebrated the healing that had taken place. Prayer Wheels have been installed in hospitals and cancer care center. They have been used in the entrance ways of yoga studios and wellness centers. Prayer Wheels can provide a focal point for healing energy and thoughts.